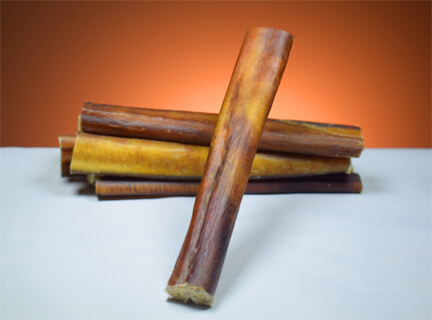 Bully Sticks - Jumbo | Treats for Dogs | Springtime, inc.
An extra thick, delicious, low-odor bully stick that keeps your dog satisfied, especially big dogs and heavy chewers! Springtime's low odor, free range Jumbo Bully Sticks are extra dense and thick for maximum chewing and boredom busting. Big dogs or heavy chewers love to sink their teeth into this flavorful, long lasting treat. Top of the line in taste and quality, these bully sticks are easily digestible, with no additives or preservatives. 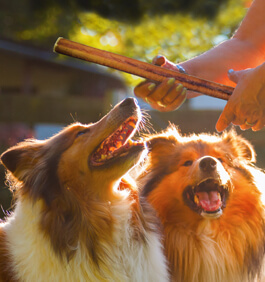 Springtime's line of long lasting, natural Bully Sticks encourage healthy chewing habits as well as keeping dogs happy and occupied (making us dog owners' happy as well!). And Springtime Bully Sticks work great as a dental treat, keeping gums and teeth healthy without additives or sugary carbohydrates. Springtime's Bully Sticks are made without preservatives or dyes. Jumbo Bully Sticks are food-grade, triple washed and hung vertically to dry, ensuring minimal odor. A safe alternative to products like rawhide, our lines of Bully Sticks are 100% digestible, low in fat, gluten free, and a good source of protein. Directions: Store in a cool, dry place. Supervision is recommended, as with any chew or toy. Ingredients: 100% beef pizzle. USDA Inspected. 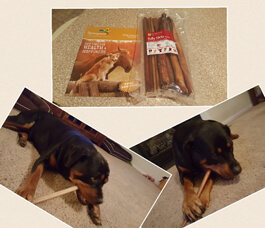 Springtime's Jumbo Bully Sticks - Thick & tough enough for heavy chewers! Heather’s girls gave the seal of approval! This is a photo of our supplements that were delivered today, along with the new treats we decided to try. Our girls' give the new Bully Sticks - Jumbo two thumbs up!